If you’d like details on how to become a Star Patron be sure to check out the A Problem Like Jamal Patreon page. Check this out if you’re moved to! A Problem Like Jamal is now on webtoons.com. This is good news for all you mobile comic readers. You will still be able to catch updates* in all the usual places. But, now you can keep up with Jamal on Web Toon’s mobile platform. All you’ve gotta do is download their app and you can read specially reformatted versions of the strips that have been optimized for reading on mobile devices. Web Toons also lets you comment, rate and subscribe (IMPORTANT). If a comic gets enough subscriptions they get pulled up to Power Caller Status and actually get paid!Plus subscribing means you get notifications to your phone the moment the comic updates. What’s better than that? *All updates except for the Sunday format color comics. Those will be posted exclusively on this site. 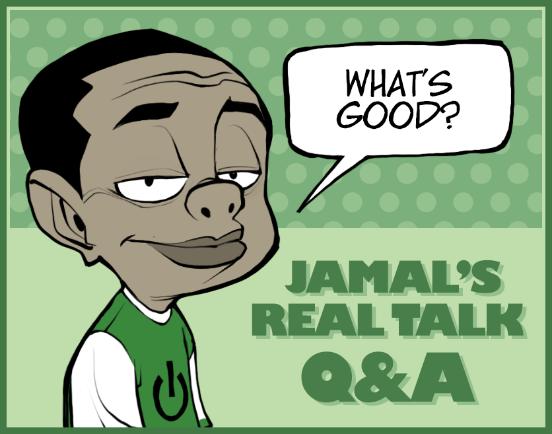 Steve and Jason over at Digital Strips podcast were kind enough to review Jamal today! These guys are hilarious and thoughtful and probably handsome. I don’t know. They seemed to like my strip and so far everyone who’s liked my strips has been an absurdly attractive person. You can get dat podcast hea. Just wanted to take a minute and welcome all the new readers from the Facebook page. We’re only just getting started here, but I hope you’ll keep coming back for more! Visiting the site regularly and spreading the word about A Problem Like Jamal are some great ways to support the comic. Here are a few other ways! Be sure to check back every few days for the latest installment!